The WA Country Health Service is committed to providing accessible health services to the regional population, and a quality health care workforce. We have a clear purpose and set of values at the WA Country Health Service. All of this is reflected in our strategic plan which is aimed at improving health service delivery to WA country communities. 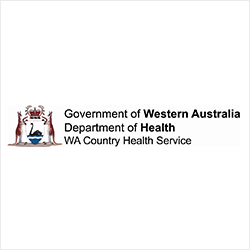 The WA Country Health Service is currently organised into seven regions to deliver quality healthcare to residents and visitors in country Western Australia. The WA Country Health Service has a strong network of public hospitals, health services and nursing posts located across rural and remote Western Australia. Our core business is the provision of quality, accessible health services to people from large regional centres to those in small remote communities. Illness and death rates among Aboriginal and Torres Strait Islander people are significantly higher than those of the non-indigenous population. Aboriginal and Torres Strait Islander people represent 13.2% of the population within the WA Country Health Service (WACHS) regions and represent an even higher percentage of the major users of health services. WACHS works in partnership with Aboriginal communities and health service providers to ensure that Aboriginal and Torres Strait Islander people receive culturally-appropriate health care that meets their increased needs. Aboriginal and Torres Strait Islander people are disadvantaged with respect to a number of social and economic factors, such as education, income, employment and housing. This places them at greater risk of poverty, violence, ill health and reduced wellbeing (ABS, Australian Social Trends 2000). Addressing the pre-determinants of chronic disease (including nutrition, smoking, physical activity, and child and maternal health). For more information on the status and priorities for Aboriginal health you may wish to access the National Aboriginal and Torres Strait Islander Health Plan 2013 – 2023 an evidence-based policy framework designed to guide policies and programmes to improve Aboriginal and Torres Strait Islander health. There are many opportunities for a General Practitioner to be employed with WACHS, and with a vast Aboriginal population spread throughout our seven regions; opportunities to work with Aboriginal people are plentiful. Hospital salaried positions require a medical practitioner with extensive generalist experience, able to demonstrate significant emergency department and primary health care knowledge and skills. The role enables a wide scope of clinical practice in Aboriginal health while working closely within a supportive team of friendly staff. Additional skills in obstetrics, anaesthetics are well utilised to complement the current multidisciplinary teams at each of these sites. The suitable candidate must be eligible for registration with the Medical Board of Australia and either a Fellow of the Australian College of Rural and Remote Medicine (FACRRM) or Fellow of the Royal Australian College of General Practice (FRACGP). Appointment to this position is based on skills and experience with a minimum requirement of 12 years experience in a general practice environment. The successful candidate must be capable of independent practice. In the Kimberley, Pilbara and some Midwest sites, these positions are classified as ‘District Medical Officers.’ Further South in the Goldfields, Wheatbelt, Great Southern and South West sites the positions are named as ‘Senior Medical Practitioners. WACHS > Work with us > Medical Careers > Medical Vacancies.